Now, we shall expand on the aforementioned feature updates. Teamie is a cloud-based collaborative learning platform that fits into your ecosystem; that’s our tagline! One important aspect of collaboration is sharing. Instructors can make their lessons public and share them with the lesson bank for other instructors to copy and reuse. Similarly, instructors can use Import Content feature to quickly import content from existing classrooms into a newly created/existing classroom. In order to extend this collaborative sharing to a more granular level, we have bought a new feature by which instructors can quickly copy a lesson page to the same lesson, another lesson or a new lesson of the classroom. Different instructors might have different use cases which they would be able to achieve with this feature. Some use cases, such as, reusing similar lesson page content or repurposing the layout of an existing page with new content can sometimes be quicker and convenient than creating the page from scratch. The workflow is quite simple and user-friendly. 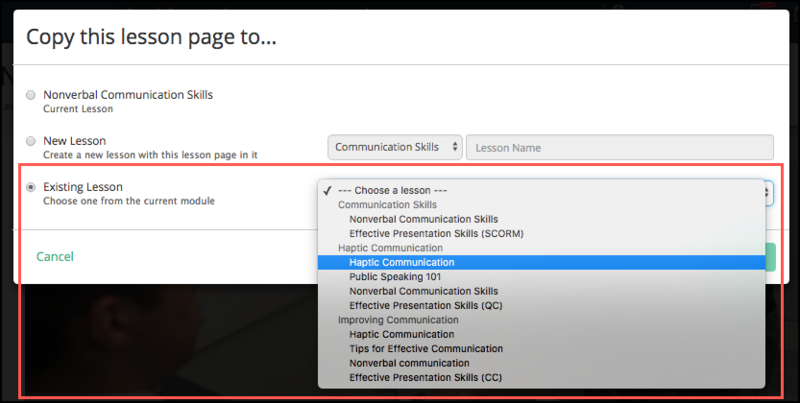 Once on a lesson page, the instructor will see the “Copy this lesson page to…” button under the lesson page settings. Copy the lesson page to the source lesson, i.e. duplicating the lesson page. Create a new lesson and copy the lesson page to it. You need to select the section in which you wish to create the new lesson and add the name of the new lesson. Copy the lesson page to an existing lesson. As mentioned before, currently the lesson page copying workflow is restricted to the same (source) classroom. Teamie Ultramarine (1.44) will prove to be a very productive update for our clients using the Teamie-Google integration. For those not familiar with Teamie-Google integration, it is an existing feature which gives our users the ability to leverage the productivity of Google Drive for making learning even more collaborative. Google Drive files can be added as attachments to Teamie posts, lesson pages, assignments and attempts made by learners. Teamie automatically shares these Google Drive files, with the set permissions, with the users who can access the file on Teamie as well as Drive. For instance, an instructor can add a Google Doc in a lesson page and it will be available to all the learners who have access to that lesson page. 💡By default, view access will be given to learners. Although, that can be changed as per the requirement. Although Google integration has been going strong with Teamie for quite some time, we decided to revamp it with an even better integration engine (you know the APIs, requests and libraries – stuff with which we won’t bore you!). The gist is that now you can expect the file sharing and access grant workflow to be faster and more reliable than ever. Our development team has worked their socks off to improve the architecture and harness the best out of Google Drive for you to collaborate more effectively and effortlessly. Most of the magic is done under the hood and would not be visible to the naked eye, but you surely will notice the efforts made by the team with this performance upgrade. We would love to know your feedback on the Teamie-Google integration, now vs earlier. Shoot a mail to us at support@theteamie.com or give us a shout out on the social media. Sometimes instructors want learners to make new attempts to an assignment even after their scores are published. 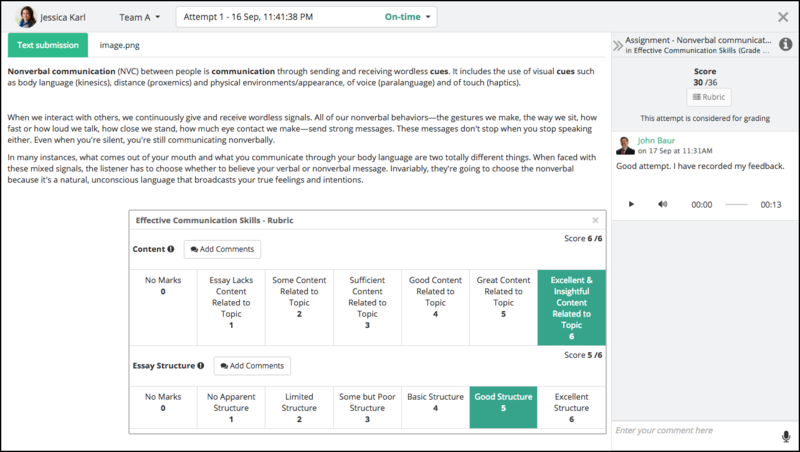 For instance, learners sometimes would want to resubmit their work after seeing the score and the feedback they have received. Before Teamie Ultramarine (1.44), when an instructor publishes scores for an assignment, learners are not allowed to make any further submissions, which may contradict with the learners’ resubmission process. 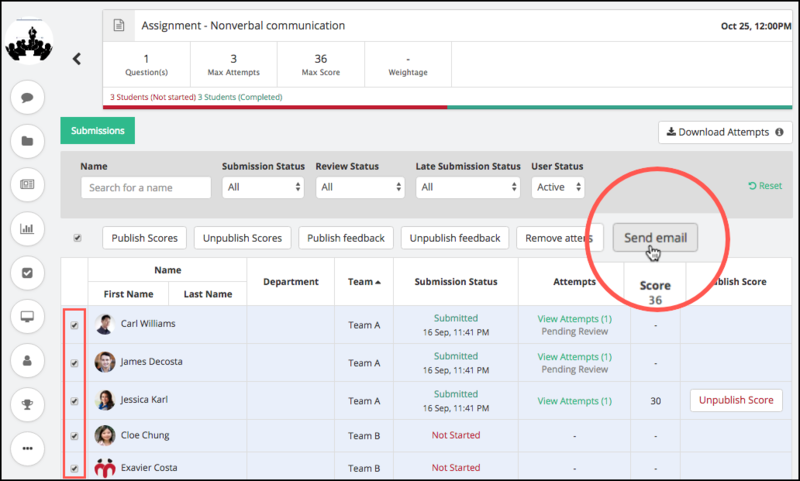 We have come up with a solution for this scenario in the form of a new assignment setting, “Allow attempts after scores are published“. This setting is present in the form of a radio button, which instructors can enable to allow attempts even after the scores are published. Take note that the latest attempt will be considered for grading by default. Also, the learner will be able to resubmit their work only if multiple attempts are allowed on that assignment and they have not yet exhausted their quota of attempts. 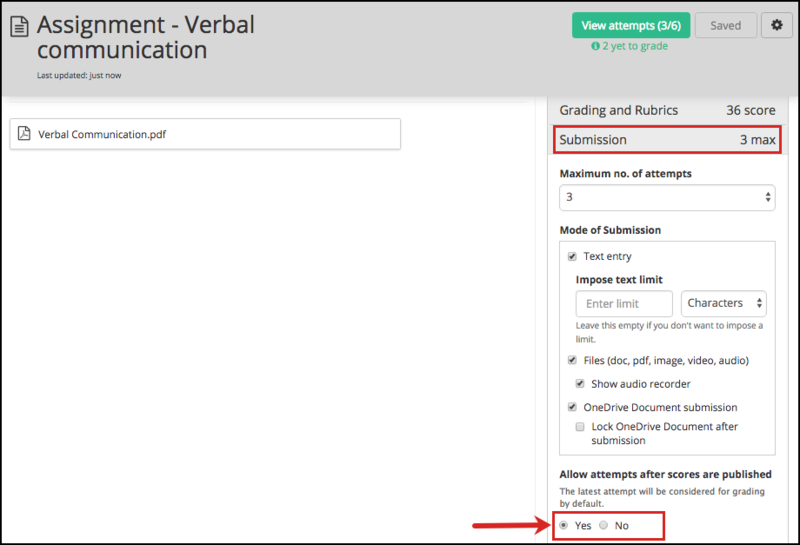 The Send Reminder feature available in the attempts view for assessments allows emails to be sent only to users who have not made a submission yet. 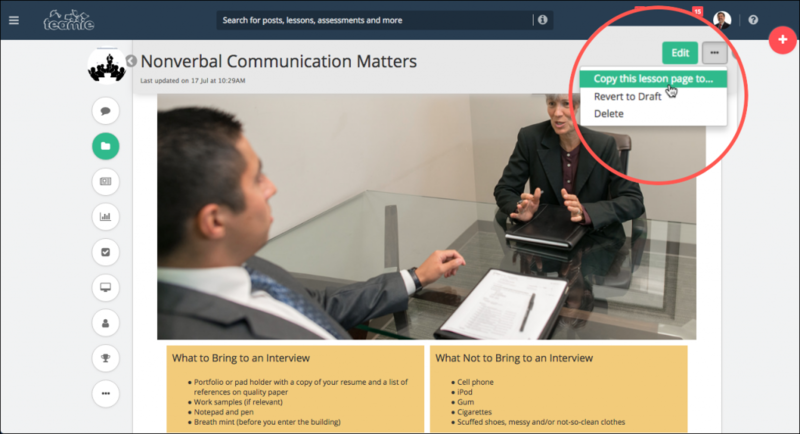 However, instructors have several use cases in which they want to send an email to learner(s) regarding the submission even after they have made an attempt – a common scenario being the instructor requiring one or more learners to reattempt the assessment that they have already made submission to. We have made the upgrade to replace the Send reminder option to Send email option for assessments. 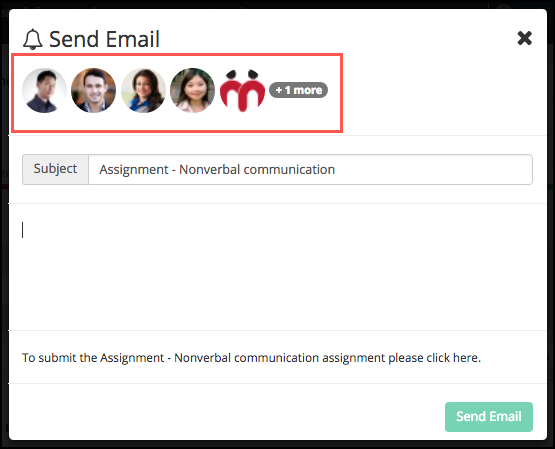 As an instructor, you can now send an email to any of the learners on the attempts view page of an assessment, including those who have already made an attempt. Most of the content created/updated on Teamie is autosaved to always keep your work safe and updated in case of internet failure or power interruptions. We have been using a minimalistic interface to show the autosave progress in order to provide the maximum work area for the content itself. But some of our users have shared their feedback requesting a much more prominent autosave interface. As an instructor, when you create a rubric, you may add different criteria; set scores to scales, rename them etc. 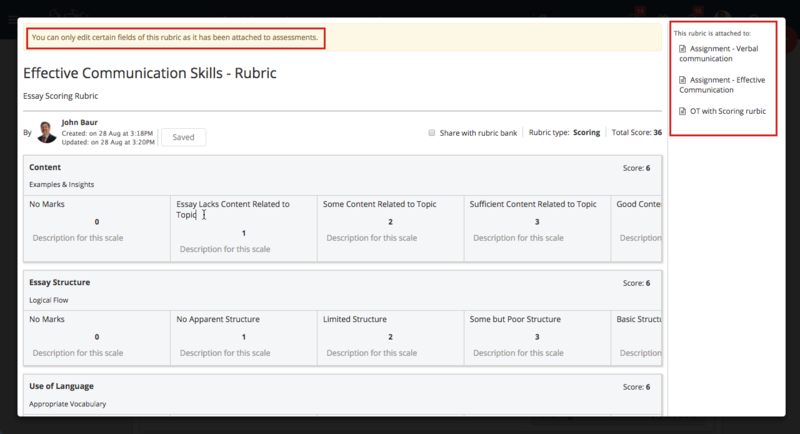 But, once the rubric has been attached to an assessment, it is no longer editable. This is done to keep learners’ score unaffected across different criteria. Some instructors have shared their feedback wanting the ability to edit their rubrics even when the rubrics are attached to assessment(s). A simple use case for this being the need to correct any spelling errors or editing description for the scales. Such cosmetic changes would not affect the scores, so we decided to allow certain rubric fields to be editable. Also, the assessment setting title Grading is changed to Grading and Rubrics. This is done to make it more appropriate and helpful for new users. Note that this will be applicable only for Teamie sites on which the rubrics feature is enabled. That’s it for this update. See you soon! Stay healthy and keep collaborating.